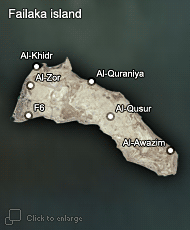 The fort at Al-Zor is located on the western coastline of the island, not far from Al-Khidr. It probably represents an Arabic type of fortification built on the similar rectangular ground plan with protruding corner towers like the fort at Al-Quraniya. The site was first prospected by the Italian and Kuwaiti-French missions and then was excavated in the early 2000s by the Kuwaiti mission. In 2006 KSAM mapped the site and created a topographic plan and top plan of the excavated part of the fortress with the help of photogrametric methods.